The latest recording of this work, performed by the composer, is available on SENSATIONS CD. Autumn Rhapsody was composed during the Autumn months in Sydney, Australia, for inclusion in a programme of original works performed by the composer, at the World Forum concert, held at Oxford University (UK) in August 2012. The work is both impressionistic and lyrical, featuring rich contemporary harmonies. The free rhapsodic sections are counter-balanced by rhythmic sections. The writing incorporates the wide compass of the piano while the dynamic range and sonorities help to create a meditative mood. "It is awesome! Such beautiful, pianistic, sensitive writing! I am so very, very grateful to hear such quality music!" 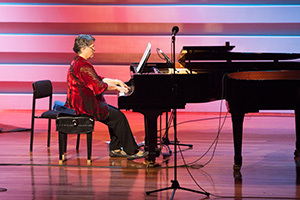 "The highlight of the night was Margaret Brandman herself performing several of her works for piano. 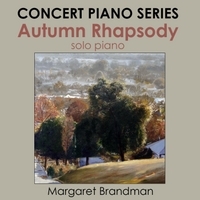 Of particular note was her performance of her newly-composed solo work, Autumn Rhapsody.This work demonstrated Brandman's affinity with jazz and solo piano writing, as well as her skills in performing classical piano. This piece was infused with virtuosic writing, as well as syncopated rhythms which had the audience tapping their feet." Autumn Rhapsody is published by Furore Music and was listed as Product of the Week in November 2013. Contact Furore to purchase this work.